I reckon getting MJ on board for this retro throwback would've been perfect, and perhaps quite possible, as he was especially fond of the original games back in the day. The real kicker is, there would have been no frustrating hardware restrictions or limitations today - something that discouraged and dampened his vision back in '93. Speaking of Sonic Mania, how did the young/modern Sonic fans gel with the game, @TB100 ? I've read that the Sonic community is pretty divided, so I'm guessing some of the old lore and characters in Mania was lost on a large chunk of the younger fanbase? Or did everyone welcome it, young and old? As I was compiling my list for the "Tunes that Spark your Spirits" thread, I came across something rather peculiar if not all that interesting. I reckon getting MJ on board for this retro throwback would've been ideal, and perhaps quite possible, as he was especially fond of the original games back in the day. We'll need to get an Ouija Board and a necromancer to contact his spirit from within. I think this image alone should speak for itself. By a good majority of the fandom so far. Now of course, there is a chunk of the fandom that doesn't care about Mania for various reasons, But when looking at the bigger picture overall, Mania has been a pretty big hit so far. 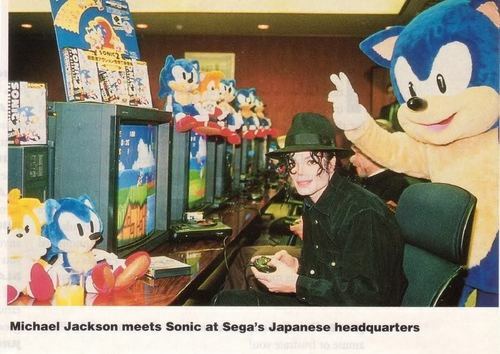 I really wish SEGA could dig up the original 41 unconverted studio tracks that Jackson and his team composed/sent to them. Have any of them ever been leaked or heard in public? Do the original studio recordings even still exist? It would be swell if they could cut a deal with the Jackson Estate, and release them to the public. @TB100 Splendid to hear that about Mania. Getting the old style and sensibilities right is something most throwbacks fail at these days, which really turns me off the whole retro reboot craze. As they say, "beware of imitations". In regards to the music...sadly that kind of thing doesn't seem like it wouldn't be preserved. Already in general this kind of thing is rarely preserved but considering the fact that Jackson wasn't even credited would mean that these tracks don't hold a lot of value I'd say. But who knows, Masato Nakamura's demo tracks for the first 2 games were preserved and even got an official release. In regards to Mania..modern Sega I would hardly trust to really do much justice to anything having to do with Classic Sonic. Dedicated Sonic fans have pretty much completely replicated the Classic Sonic engine and is better than anything than say, Dimps has ever done. Sonic Mania is pretty much a glorified fan game. I think it's sad that fans know Classic Sonic better than Sega does but then again it's not the same Sega. I’m interested in how japanese development studios work in Japan. Because I do believe their is a very big difference between SEGA and The Sonic Team. One or the other is at fault here. and Sonic forces was a very good sonic game. I tend to hold a bunch of unpopular opinions! So this is something interesting I found while browsing on the internet, it's basically a version of Sonic 3's mini boss that's a bit more advanced then the original version. But it is interesting to hear nethertheless. So I realized I never really talked about Sonic Forces. Overall, It's simply one of the most mediocre Sonic games i've played. There's nothing bad about it, but there's nothing really great about it either. the avatar is fun to customize, the soundtrack is unsurprisingly great (Except for a majority of Classic's soundtrack as the only tracks I really enjoyed there was Ghost Town and Casino Forest with the others being either decent or meh) Sonic's writing here is pretty great and some of the voice actors/actress are definitely showing some improvement, Modern and Avatar's levels are fun to go through. The Classic Sonic tracks in the game are by far the ones people are most mixed (and outright negative) on, thing is I actually don't think the compositions themselves are that bad, it's just the instrumentations that miss the mark, because while yes; they do sound like Mega Drive music, they also happen to go for the kind of instruments that Mega Drive Sonic (mostly) avoided, in order to sound different from other games on the system. But Classic Sonic is bad (His gameplay is a step backwards from even Generations) and feels just unnecessary. I kind of wish that had lyrics. Does anyone here like the inclusion of Infinite? Because all Sonic needs is more edginess right? His theme is decent but it's more modern Sonic music. And is Sonic Chronicles any good? It's kind of an obscure game I've only read about in Nintendo Power.